We actually always thought our house would be red. Or better, a classic combination of red and white. Grey was also an option, it would have been nice as well, but somehow looking at the landscape and neighbor houses we felt that a red house would be the best choice there. Yes, my thought exactly: how many 'reds' are there???? :-| The funny thing with colours - at least for me as absolute layman - is that the more you try to engage with them, the more confused you get. This system allows to shape colours on four axes on a 10%-stepwise progression. 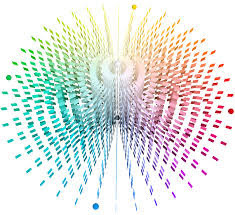 The axes define proportions between blackness and chromaticness as well as the closeness to the four basic colours yellow, red, green, and blue. Just to say: if you have to decide about a color concept for your house, I strongly suggest you play around with this system (there are plenty of apps that helps with this, like the Kaba Farbe App). We looked at them from different perspectives, with sun, in the shade... the final decision was tough, but at the end we went for the second red from the left: NCS S 5040-Y90R. The white, which you can also see in the sample above (window frame) is NCS S 0502-Y. We use Jotun paint for both colours.